Pamper your feet by keeping them dry and comfortable with our soft Sasawashi room shoe. Easy to slip on and off, the simple design includes a suede-like sole and Sasawashi fabric interior. It's the perfect accessory for a casual day at home or at the spa. 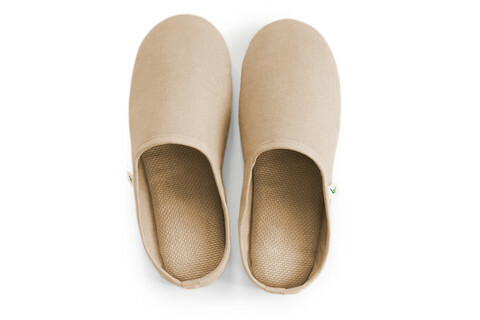 The lightweight, flexible material makes them the ideal travel slipper. Made from a blend of washi (Japanese paper) and fibers from the Kumazasa plant, Sasawashi is a durable fabric with twice the absorbency of cotton. The Kumazasa plant is known for its natural anti-allergen, anti-bacterial and deodorant properties. Machine washable. 100% washi paper upper, 100% polyester sole.